Lastly, I just want to mention that I have noticed that the original two pioneers of CRISPR technology, Emmanuelle Charpentier and Jennifer Doudna and their research teams, are sticking to basic research. That is to say they study the exact mechanisms by which CRISPR/Cas9 works, elucidate the atomic structures of these protein-RNA-DNA complexes and are still looking for other related systems to better understand how bacteria protect themselves from infections by plasmids (circular bits of DNA) and bacteriophages (viruses that infect bacteria). Despite the high-profile patent case they are involved in and all the other labs around the world that are now using this technology in various applications, such as gene therapy or plant engineering, they remain focussed on simply increasing our knowledge of nature, which I find laudable. Zetsche B, Gootenberg Jonathan S, Abudayyeh Omar O, Slaymaker Ian M, Makarova Kira S, Essletzbichler P, Volz Sara E, Joung J, van der Oost J, Regev A, Koonin Eugene V, Zhang F (2015) Cpf1 Is a Single RNA-Guided Endonuclease of a Class 2 CRISPR-Cas System. Cell (in press). 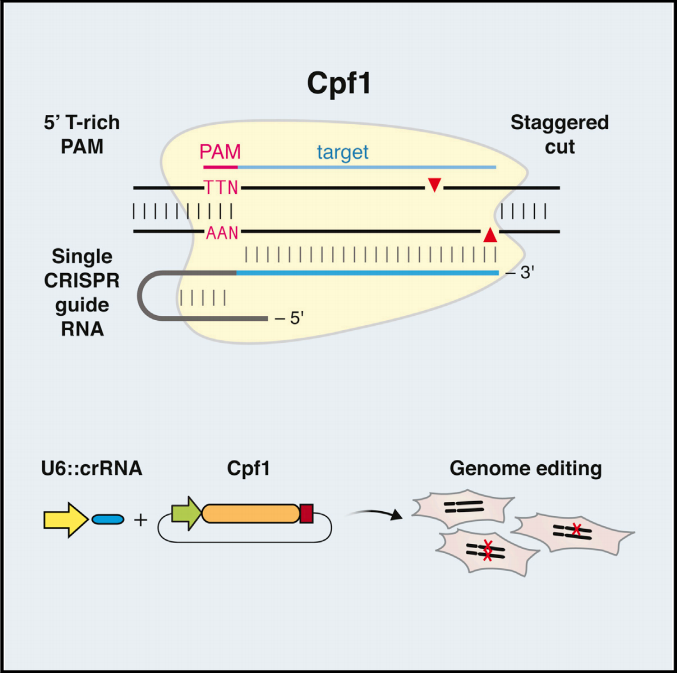 This entry was posted in CRISPR, Factual, Opinion and tagged Charpentier, Cpf1, CRISPR, Doudna, Genome-editing, Zhang by Victoria Wang. Bookmark the permalink. Hi, I am QIngbo, from The University of Tokyo, Japan. Thanks a lot for reading this comment despite your busy schedule. I study the fundamental mechanism of CRISPR/Cas genome editing, and I have been a big fan of your blog for long!! And as a result, I made up my mind to apply for Crick Ph. D program this year. Hence I would like to ask several questions about the Ph. D life there as well as the application process. Would you mind taking time to give me a favor? It would be really appreciated. If you have time, please give me an email. Thank you! Hope to hear from you back!! Thank you for your comment – of course I’d be happy to answer your questions. You can reach me at victoria.wang@crick.ac.uk. As far as I know no group at the Crick is directly researching the CRISPR systems from a basic research point of view. However, several labs are of course using it in various applications.